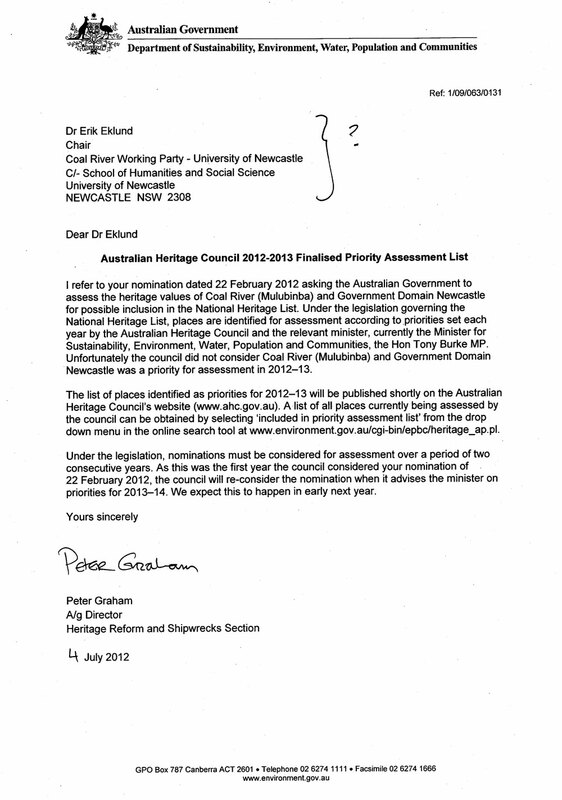 The letter above was received this morning from Mr Peter Graham A/Director Heritage Reform and Shipwrecks dated 4 July 2012, and incorrectly addressed to “Dr Erik Eklund” notifying him that the Australian Heritage Council did not consider Coal River (Mulubinba) and Government Domain Newcastle a priority for assessment in 2012-2013 for inclusion on the National Heritage List. Dr Eklund has not been Chair of the Coal River Working Party since the end of 2007, when he left Newcastle to take up a Professorship at Monash University. This is our third attempt, and we find it extremely disappointing that we have not been able to convince the Australian Government to date that Newcastle is a place of historical and cultural significance to this nation. On behalf of the University’s Coal River Working Party, I would like to thank our historians and researchers, especially Ann Hardy for her efforts in preparing our Nomination and for those in the wider community that support them. Our members are very generous in volunteering their time to achieve recognition for our city and region and it is a great honour to work with such people. Once again Newcastle gets sharfted, but thanks for trying.